We were alerted to these in the course of the ongoing support campaign for Aarona K. and Ndiame D. The two Senegalese asylum seekers were criminalised after having witnessed an attack by the guards on a third West African asylum seeker in the AEO in early September 2017 . A number of former security employees and numerous inhabitants informed us that this is not the sole case: The scale of security guard violence against refugees in the AEO has been systematic since the summer of 2017. According to the inhabitants, the violence has somewhat gone down since the fall of 2017, but continues. The latest incident was on May 7 as a Nigerian couple were badly abused by the guards. Our independent investigation has revealed that several of the ex-guards witnessing against Aarona K. and Ndiame D. are under the above mentioned criminal investigation. We have gathered other testimonies against these and other (ex-)employees (example: Oumar B.). They confirm that particularly Black Africans have been confronted with an increasing violence and massive brutality by the private security company and have thereafter been victimised and criminalised by the police and the criminal justice system. Former guards have confirmed that a “special team” of security personnel was routinely provoking and enacting massive violence on refugees since the summer of 2017 and that this was authorised and encouraged by the bosses of the security company. The police would frequently record the guards’ version of the incidents. The first court hearing in the case against Aarona K. and Ndiame D. on March 27, 2018 was suspended shortly after beginning. Thereafter D. was deported to Italy and the case against him was suspended. 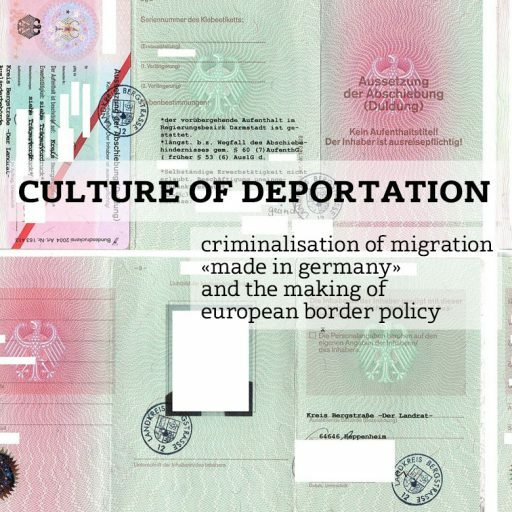 Currently D. is in the deportation prison in Eichstätt, Bavaria, after returning from Italy where he was facing life on the street with no means of livelihood. The date for the next court hearing against K. is still to be announced. Read here the call for support for Aarona K. and Ndiame D. in English. Read here the call for support for Aarona K. and Ndiame D. in German. Read here the report of the first court hearing of K. and D. (German). Watch here the testimony of Oumar B. on how Bamberg security guards attacked him in September 2017.